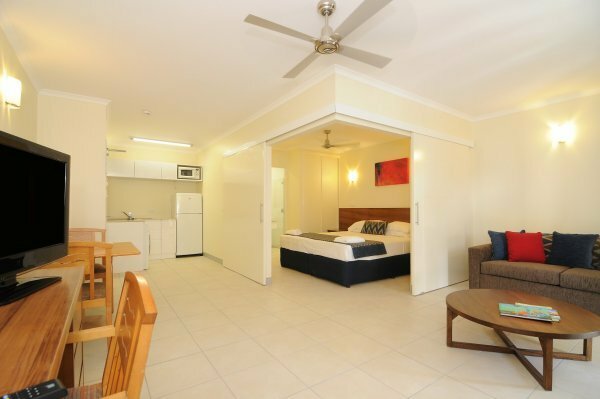 Cairns Apartments Hot Budget Deals On Right Now - SAVE $$ Cairns most popular budget hotel and apartment style accommodation, located within easy walking distance to the Cairns waterfront esplanade. Recently a fresh new look and image has been unveiled. 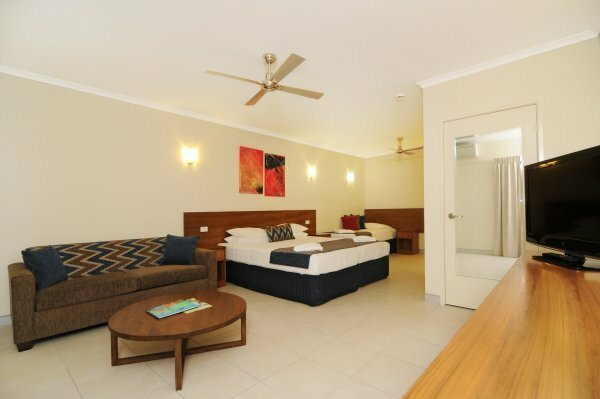 Cairns Queenslander hotel motel now boasts a wonderful contrast of deluxe modern contemporary design and traditional Queensland style room types to capture the essence of the laid back tropic lifestyle of Queensland. 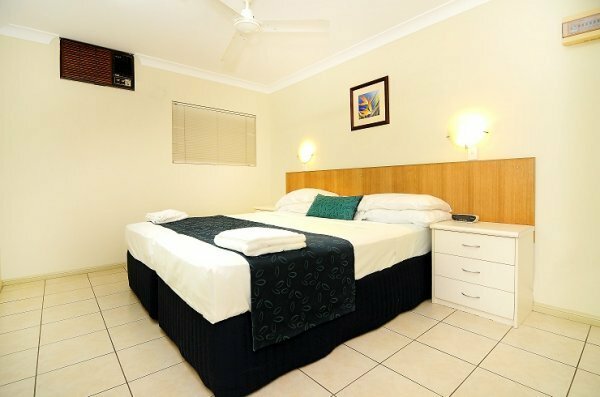 The Cairns accommodation hotel - motel facilities include 112 guest rooms in total a mixture of hotel and serviced apartments all with their own private balcony table & chairs. The hotel - motel offers 24 hour reception, 2 swimming pools, 2 elevators, disability accessible rooms, WiFi & guest internet terminal access, Austar Satellite TV, housekeeping daily, room mini tidy, on site car-parking and ‘Steak on Lake’ Char-grill Restaurant open for breakfast & dinner daily. The friendly , courteous and helpful staff look forward to welcoming you soon. All rooms are designed with the tropical climate in mind featuring cool tiles, light colors and full air-conditioning and private balconies. 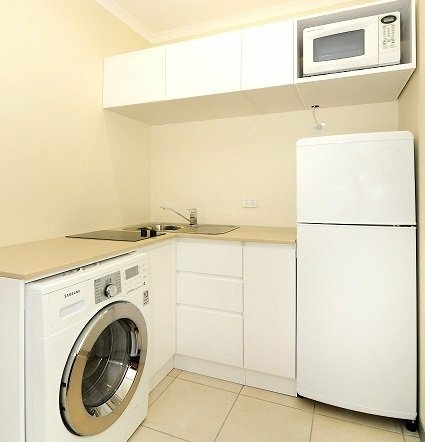 Guest coin operated laundry facilities are also located on the property. For guests health and wellbeing, before every guest arrival all mattresses and pillows are sanitised for using the revolutionary ‘SleepEasy’ cleaning system. KIDS STAY FREE up to 2 Adults & 2 Children (under 14 yrs) in existing bedding. This modern contemporary style hotel room features private bathroom with monsoon shower. Bedding consists of a King size bed or two single beds plus single bed and a sofa bed for additional guests (fees apply). Lcd TV, STD/ISD direct dial telephone, individual controlled air-conditioning, ceiling fans, tea & coffee making facilities and wifi available. Private balcony. (Maximum 4 guests). Modern 1 bedroom apartment designed for guests that may wish to prepare some meals. Room features private facilities with monsoon shower. Bedding consists of a King size bed or two King single beds or combined with a deluxe sofa bed for additional guest (fees apply). These one bedroom apartments feature a modern kitchenette including microwave, stove top & full size refrigerator. Air-conditioning, ceiling fans, laundry - washing machine & dryer, Lcd TV and wifi available. Private balcony. (Maximum 3 guests). Spacious large self-catering apartment featuring two separate dual key rooms comprising of an One Bedroom Apartment & Deluxe Hotel Room. Private facilities include two separate monsoon showers. Room facilities also include: Modern kitchenette including stove top, Microwave and full size refrigerator. Bedding allows for configurations up to 6 persons (fees apply). Full laundry including washing machine & dryer. Private balcony with outdoor setting. (Maximum 6 guests). Great open plan self-catering room perfect for leisure or business. This traditional Queenslander style room features a king or queen size bed or two single beds with ensuite -shower above bath-tub. The room also features a dining area with kitchenette, dining table & chairs. The lounge area offers two lounge chairs with table. All rooms also feature satellite Tv, radio alarm clock, Individual air conditioning, ceiling fans, direct dial phone, refrigerator & hairdryer. Balcony with outdoor setting. (Maximum 3 guests). 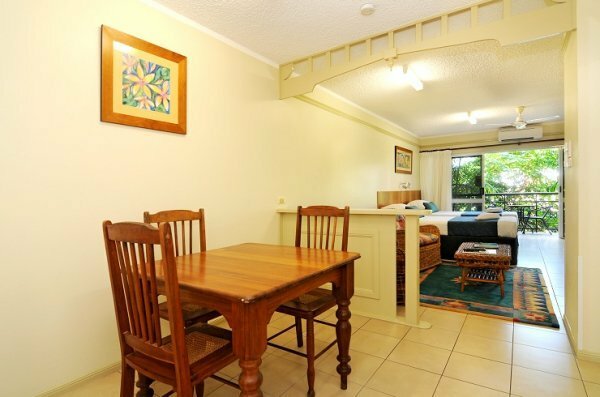 Traditional Queenslander style self-catering apartment perfect for a group of adults travelling together or families with kids that require a separate twin bedroom. This room type features a queen size bed in one bedroom & two single beds in a separate bedroom. The room also features one bathroom with shower above bath-tub, kitchen is complimented with a separate dining area with dining table with chairs. The lounge area features satellite Tv with lounge chairs and table. All two bedroom apartments also feature individually controlled air conditioning, ceiling fans, direct dial phone , radio alarm clock, hairdryer and balcony. (Maximum 5 guests). 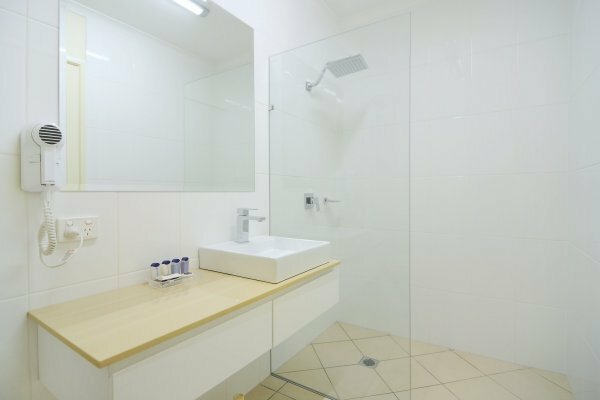 Cairns Queenslander offer designated disabled access apartments within a tropical garden setting. Disabled rooms are located on both the ground floor and third floor via lift access. The Deluxe Hotel rooms offer level access showers with grab rails, accessible balconies and are tiled throughout. 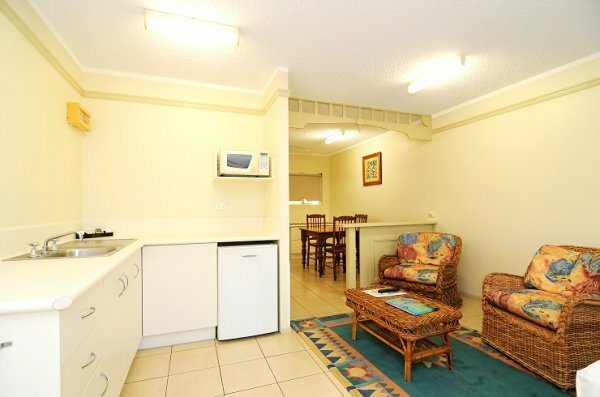 Our 2 bedroom self-contained disabled apartments also include the features of the Deluxe hotel room with the addition of kitchen and laundry facilities. Both wheelchair accessible rooms have full level access to the resort on-site restaurant and pool area. Please contact the Cairns Holiday Specialists so we can ensure you find the perfect wheelchair accommodation & tours for your next holiday. Ideal for Groups! This property is ideal for groups, with a central location to many sporting venues, conference venues and great rates on accommodation with cooking facilities. Cairns Queenslander Hotel & Apartments new look and upgrade is complete. 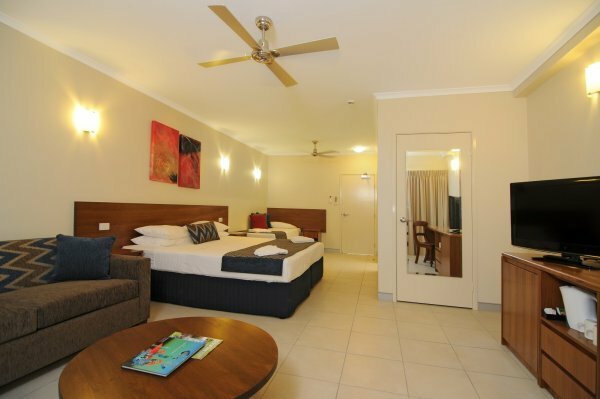 The Cairns Queenslander Hotel & Apartments now offers 112 rooms in total consisting of three NEW Deluxe Room types! 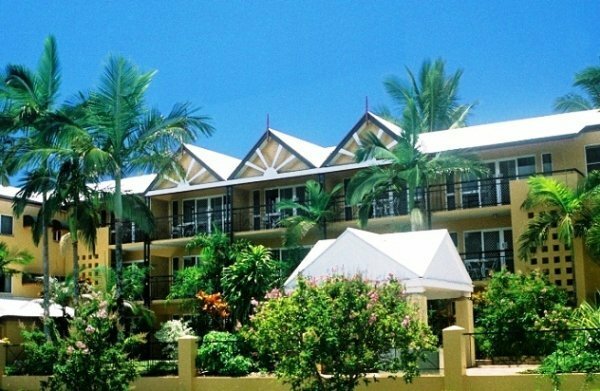 Cairns Queenslander hotel offers friendly helpful staff, Reception open 24 hours, two swimming pools, with breakfast & evening meals available at the onsite Restaurant ‘Steak on Lake’. The Cairns Queenslander is ideally situated only a short stroll to the North Esplanade parklands, from there you can enjoy a pleasurable walk along the Esplanade walking track (enormous variety of native birdlife, including wild pelicans & lorikeets can be seen daily) towards the Cairns lagoon swimming pool and heart of the city. Only a short walk is the Kids Funship Playground which will keep children of all ages happy and Muddy's playground. 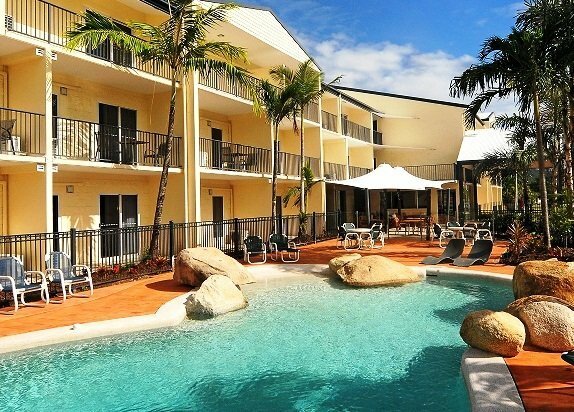 The budget holiday accommodation at Cairns Queenslander apartments are located within 4 kms of the Cairns International Airport and are within walking distance to all attractions in the Cairns City Centre. After a day of activities - diving on the Great Barrier Reef. , travelling to Kuranda on the Skyrail gondola, bungy jumping at Smithfield - you'll be put at ease with the knowledge that your holiday accommodation is close to Cairns city and you can relax in the colonial Queensland environment. 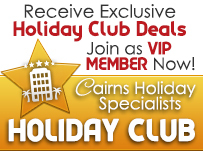 Ensure to ask us about Cairns day tours and holiday packages for your vacation in Cairns, Queensland. We can tailor make a holiday package to suit the needs of couples, families, Honeymooners, thrill-seekers, and large sports or conference groups! Ensure to pre book your day tours to receive big discounts on your Cairns Day Tours- ask at time of booking with Cairns Holiday Specialists. 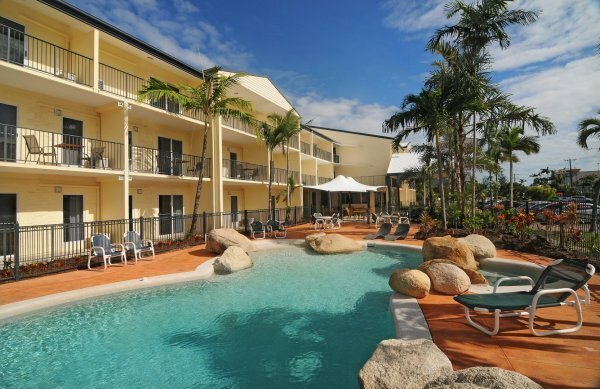 Cairns Queenslander Holiday Apartments are situated right in between the airport and Cairns City Center. It is a short taxi ride away from the airport and a 20 minute walk from the city center. 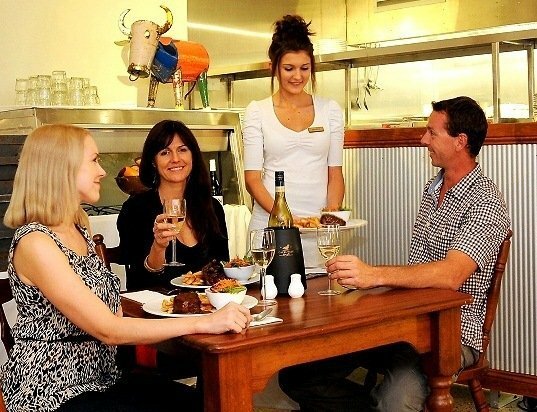 There are many restaurants and shops just a short stroll away from your cheap Cairns Accommodation. 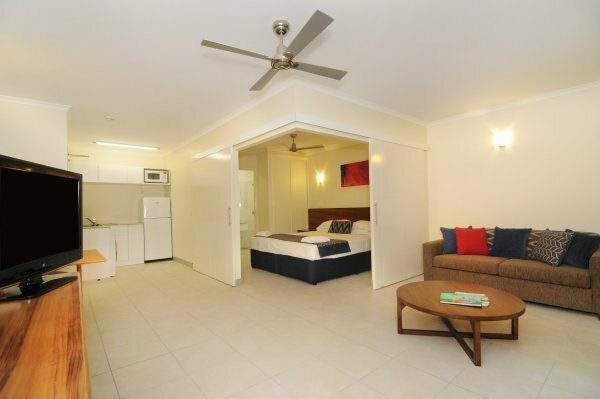 The Cairns Queenslander offers comfortable, budget hotel style and two-bedroom apartments close to the city centre of Cairns, the tourist Mecca of Tropical Far North Queensland. The apartments have been designed to enhance the tropical lifestyle and feature self-contained kitchens and full air-conditioning. Cancellations must be in writing. Cancellations must be made at least 72 hours prior to arrival or a cancellation fee of one night accommodation will apply. Children stay FREE if using existing bedding, up to maximum room capacity (up to 14 years). 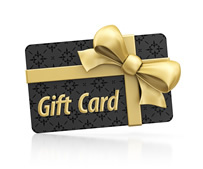 1 FREE Kids Meal when dining at Steak on Lake. Additional guest $20 per night for a rollaway bed. FREE cot hire available on request. We enjoyed our stay immensely. All of the staff were very friendly and efficient, and willing to persistent with enquiries to obtain a good outcome for us. We are so happy that you loved your stay with us. Our staff is taking great pride in looking after our apartments and making our guests feel welcome. Looking forward to see you in Cairns soon again! Hi Liz, Thank you for your feedback. Having a pool at your hotel is a definite must! 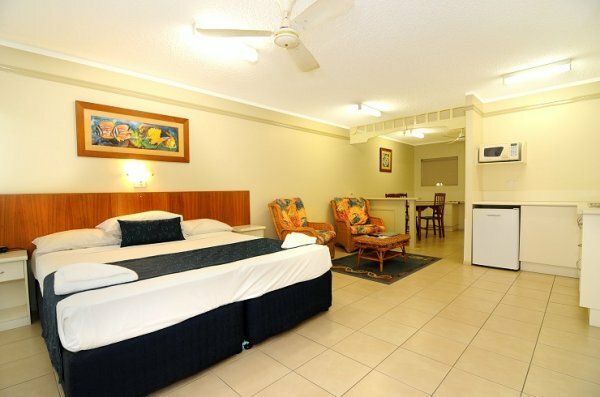 We are glad you enjoyed your stay at Cairns Queenslander. We hope to see you again soon. Yes It was comfortable and very adequate to our needs. The restaurant was a bit limited so we didnt eat there. Hi Samantha, The Cairns Holiday Specialists are always appreciative of feedback and we are glad to hear you enjoyed your stay at the Cairns Queenslander Holiday Apartments . 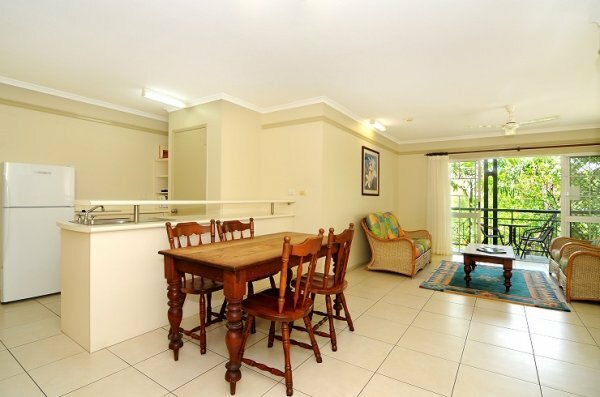 We are happy to have the fantastic range of great value apartment style accommodation in Cairns CBD. We will pass your feedback on with regards to the restaurant menu. What a great apartment. A bit of a walk to the shops but walking along waterfront made it worth it. Hi Debbie, our team at The Cairns Holiday Specialists are pleased to hear you enjoyed your stay at the Cairns Queenslander Holiday Apartments. These great value apartments, whilst at the edge of the Cairns City Centre are in fantastic proximity to the Cairns Esplanade and boardwalk and we are happy to hear you took advantage of the walk. We had an amazing time at our apartment during our 6 nights there. The pools were clean and the receptionist was very helpful with our queries. The apartment was spacious for the 6 of us and parking was never an issue. Thanks for everything....we will be back! We enjoyed Cairns and the Queenslander. It is in a great location, we were able to walk to everywhere, the staff were very helpful and friendly and it was handy to have a continental breakfast included. The room cleaning could have been a bit more thorough. Was such great service, I could easily upgrade to two bedrooms and should definitely mention the receptionist Emma, she is such lovely girl and very helpful. I had room service everyday which was great. To be honest I didn't like the buffet breakfast and the room had no drawer for cloths which was a bit of pain but the service was good enough to cover that. The stay was enjoyable and the Unit was lovely, I would be happy to recommend it to my friends. We are delighted that you enjoyed your stay at Cairns Queenslander Holiday Apartments. Being in the heart of Cairns is a great way to experience all that the region has to offer from the Great Barrier Reef out to Kuranda and up to the Daintree and Cape Tribulation. We hope to welcome you back one day for another great trip. Yes. It was clean and comfortable. The apartment was adequate, but we couldn't use the balcony or keep the balcony doors open because of the number of smokers in adjacent apartments. This was a major drawback. Free breakfast was great. Well situated. Comfortable beds. Twins made into a double quickly switched back to twins when requested for our teenage son and daughter but top sheet not provided for one. Yes. Good stay. Two separate occasions. Only complaint. Internet was so so slow we couldn't use it. Reception said that it was because the place was fully booked and everyone must have been using it. I tried in the early hours (4am) and various other times and it was still un-usable. Won't stay there again because of lack of decent wifi. We'd been camping up Cape York for 3 weeks and needed to do business (we're company owners) at the Queenslander with the wifi. Everything else was great. There was another guest also asking about the slow wifi when I was there with same query. Yes we loved our stay here. The rooms were great...actually better than we anticipated. Staff at front desk were friendly and helpful. Location was good..nice walk down the esplanade to city centre. We had a superb time at the Queenslander the reception staff were excellent, they made us feel welcome. they asked every day where we were going with the grandchildren and always asked had we had a good time when we got back. Nothing was too much trouble. Clean and friendly and reasonably priced. The restaurant was great - excellent food and friendly staff. The wifi was pretty dodgy. They said that they were working on it but since it was Christmas week I understand that it wasn't fixed. We'll stay again the next time we visit Cairns. Just an overnighter in a standard room. It was fine. Yes - Free wifi in rooms. I believe this was advertised but not available in the room we stayed in. Hi Tony, unfortunately during your stay dates our Wifi service routers received an automated software update which was not compatible and disabled the system. This was an unforeseen event. Unfortunately,it took a few days for those routers to be replaced. Thankfully our complimentary WiFi service is now back up and working well. On behalf of the Management & Staff please accept our sincere apology and we do hope overall you enjoyed your stay in Cairns. It would have been nice if the dishes could have been washed. Well located,close to major city centre. Yes we did. After an initial hiccup with the accommodation offered on arrival (they offered a disabled access room which was much smaller and with balcony overlooking the portico roof), the reception staff enabled us to downgrade to a Hibiscus room which was much bigger with more facilities. Made our stay and experience much more pleasant. The only comment that we could offer is to provide block-out curtains on windows to prevent outside lights entering the room at night. It's been quite enjoyable experience. Service could have been better but overall I was happy. Dear John, Thank you for your feedback. Cairns Holiday Specialists display images of all room types from the standard Hibiscus Suite to the Deluxe newly refurbished rooms. We are glad you enjoyed your stay at Cairns Queenslander. Very happy with standard of accom, facilities, and cleanliness. Staff very friendly and helpful. I will stay again next visit. Have already recommended to friends. Hello Margaret, thank you so much for taking the time to post your comment. We are very happy to read we met your expectations and you're recommending the property to your friends. We are looking forward to seeing you again. Kind regards from Chris & the team at the Cairns Queenslander. It was simple, but adequate. All of my team felt it was reasonable - especially for the price. Very good place to stay, easy to walk to the city centre. very good staff. Would certainly stay there again. Hi Jennifer, Thank you for your super review, delighted you enjoyed your stay. We look forward to welcoming you back. Best Wishes from Chris (Sales Manager) and all the team at the Cairns Queenslander Hotel & Apartments. 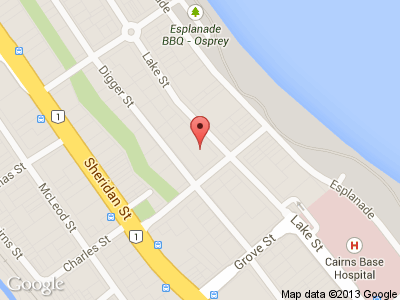 Yes we enjoyed our stay at Cairns Queenslander Holiday Apartments. It was clean and tidy and well presented. Apartment was spacious and user friendly. However only very limited utensils and just 2 of each with regards to cutlery was offered. Staff at reception were helpful regards places to visit etc. Only stayed onernight but staff were extremely helpful and gave us a later checkout. Great position to walk in to Cairns along the esplanade. I thought the Cairns Queenslander Holiday Apartments were good value for money. My apartment was basic but clean and the staff I dealt with very friendly. I think there could be more infomraiton about their restaurant as I was not aware that an inexpensive breakfast was available unitl after I had purchased food supplies. Yes. The rooms were clean and the staff (including cleaners) were helpful. It was perfect for our family of five. Excellent location one street from the Esplanade. Courteous helpful staff made our stay very enjoyable. Good value for money. Dear Lara, thank you so much for your feedback. We are most happy you enjoyed your stay with us. Kind regards Chris & the team at the Cairns Queenslander. We were very pleased with our accommodation but were unable to use the vouchers due to the weekend and the timing so paid the full fare, but they did take off the amount on our meals. The staff were very helpful and friendly I hope the new dining area is working well, it opened the day we left. Thanks everyone. Yes - all staff were most helpful and friendly - very easy to relate to. We forgot to say that the electric kettle was leaking - in Room 204. Thank you. Our room was well appointed & the girls performing the mini service were polite & efficient. I would suggest that the lines for the car parking lanes be re marked as some of the patrons abused their privelege by taking up 2 spots & on occasions we had to park out in the street. Accommodation was not in the first flush of youth but was clean, tidy and comfortable. Staff were very helpful and knowledgeable and able to answer our questions regarding trips and facilities available locally. Restaurants, tourist shops and coffee shops were within easy walking distance along the esplanade. Really good budget accomadation. Very clean and well fitted out. Leisurley walk into town along a the fantastic esplande. Very much enjoyed our stay for a very reasonable price. We found everything very comfortable, good kitchen facilities, and very clean. Could have done with change of towels mid-stay instead of after first night and then no more. Staff in office very helpful and friendly. Good for its price, though quite a way to the city - about 30 min walking (Queenslander apartments). One of the good point about it is that this place allows 1 night bookings. It is not an easy task to find one!